Steve graduated from UCLA with a B.A. degree in Economics and has lived in Seal Beach, California since 1972. After 36 years in national sales and sales management, he retired from Vision Service Plan (VSP) in 2009. Soon after retirement, Steve began his quest to learn about the World War II experiences of his father, pilot Howard Snyder, and his crew of the B-17, Susan Ruth, named after his older sister. It became his passion and has resulted after several years of dedicated research in his book, Shot Down. One result of his new career as a World War II historian is that he is a member of numerous World War II associations and is Vice President of the 306th Bomb Group Historical Association. In 1994, he traveled to Belgium for the 50th Anniversary of the Liberation of Belgium with his parents and then again in 2004 for the 60th. His attendance at the 70th Anniversary Celebrations in 2014 marked the official European launch of Shot Down. 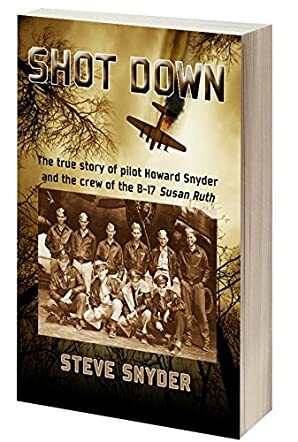 Shot Down: The True Story of Pilot Howard Snyder and the Crew of the B-17 Susan Ruth is a military history book written by Steve Snyder, Howard's son. The author played at being soldiers as a boy, but did not really understand the role his father played in WWII until he was older. His father kept in touch with many of the survivors of his crew and with the people in Belgium who helped him after his plane was shot down. In 1994, Steve accompanied his parents to the 50th Anniversary Celebration of the Belgium Liberation. Howard Snyder and his wife both died in 2007, and Steve began looking at the war memorabilia they had collected, including Howard's hand-written journals, letters and pictures. He continued his research into the Eighth Air Force and its role in the wartime effort. Steve Snyder's military history book, Shot Down, reads like a novel, yet it isn't. The names and faces are all real, but their stories are presented in such a compelling manner that this thorough and painstakingly researched effort reads smoothly and fluently as Snyder and his father's journals bring the past to life. I was fascinated as I read about the training the Air Force pilots received and saw how the crew was distributed and functioned on the B-17 bombers that they flew. The drama of the daily selection of planes and their crews for each day’s bombing is so well presented, and the pictures of the airmen watching for the planes to return brought home the perils and tension they lived with on a day-to-day basis. I also found myself totally immersed in the portion of the book that tells of the heroic and selfless Belgians who helped hide American soldiers during the German occupation of that country. Shot Down is a remarkable compilation of historical data that is presented in a well-written and thought-provoking narrative. It’s most highly recommended. So agree with you Jack. What separates Show Down and Snyder's voice from the pack is the stories in the first person... from the men; from the letters; from those who shared their thoughts in the community the men found themselves within after they were shot down. Learning that Steve Snyder, the son of Captain Howard Snyder, has stayed in contact with so many and routinely visits Belgium keeps Show Down and the men, families and those who hid and supported them during their ordeal truly alive. The 8th Army Air Corp blackened the skies with the bravest men the Allies Forces had to offer. "Shot Down" retells the story of one such B-17 flight crew through personal interviews and letters sent home to a young wife and mother. "Shot Down" is a Justified read; credible from it's beginnings to Germany's eventual surrender.